Greensboro College, in white, plays defense against Averett on its Technicolor-green, AstroTurf field. The Greensboro College men’s soccer team played the school’s inaugural game on its AstroTurf field Saturday. The Pride romped all over their new rug, pulverizing the hapless Averett Cougars, 5-0. The $1 million field was installed in less than two months. 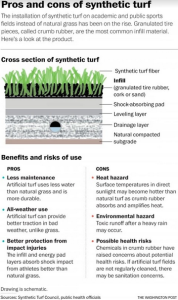 The all-weather turf is made of very green plastic grass; filling in for dirt is black “crumb rubber,” little rubber beads recycled from pulverized tires. Like dirt, they get into the clothes, shoes, hair, noses, mouths, cuts and scrapes of players, especially those required to dive into the turf often, like goaltenders. It has been used to cushion artificial turf since the early 2000s. Washington Post graphic. Click the image to see it clearly and larger; click here to see a Post article on the issue. Earlier types of synthetic turf were blamed for many knee and leg injuries. The fields were basically concrete with a thin plastic cover that would occasionally snag your cleats and rip your knee apart. And don’t forget turf toe. Those concerns seem to be a thing of the uncushioned past, though. 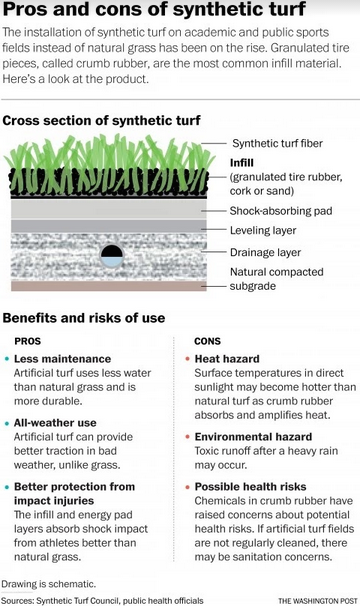 Now questions have arisen about whether crumb rubber causes cancer in youth soccer players. The AstroTurf company and industry groups the Safe Fields Alliance and the Synthetic Turf Council contend that no scientific research has linked the product to the cancers that have stricken 38 young American soccer players in recent years. Despite being a self-serving claim by parties with major economic interests in the issue, that does appear to be the case, since national media coverage doesn’t cite any and Internet searches don’t turn any up. Concerns persist because the crumbs do contain arsenic, benzene, carbon black, lead and other chemicals, some of which are carcinogenic. The company and trade groups say the amounts are harmlessly minute. They consider the scientific case for their products’ safety to be conclusive (“There’s an incredible amount of misinformation out there.”). Nevertheless, some customers are choosing organic alternatives despite their higher price. The industry would like the EPA and Consumer Product Safety Commission to take a public stand in agreement with them, which, for whatever reason, the agencies so far have chosen not to do. AstroTurf was invented by Monsanto in the early 1960s, adding to a product line that at various times included DDT, Agent Orange, PCBs and now genetically modified crop seeds (which all contribute to Monsanto earning the unofficial title of the most evil company in the world). The revolutionary artificial turf originally was marketed as “ChemGrass”; it was renamed in 1966 when it was installed in the Astrodome, the eighth wonder of the world. Monsanto sold the business in 1988, well before crumb rubber was even invented, and it has changed hands three times since, once being bought out of bankruptcy. Skidding soccer players kick up a small cloud of crumb rubber on Greensboro College’s AstroTurf field Saturday. This entry was posted in Greensboro College and tagged artificial turf, AstroTurf, cancer, crumb rubber, Monsanto, most evil company in the world, soccer. Bookmark the permalink.